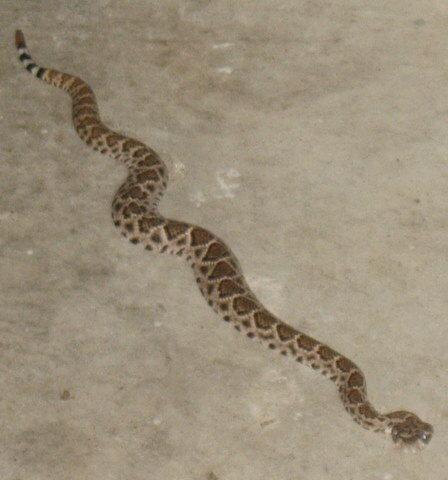 THIS baby rattlesnake was in our garage last night. 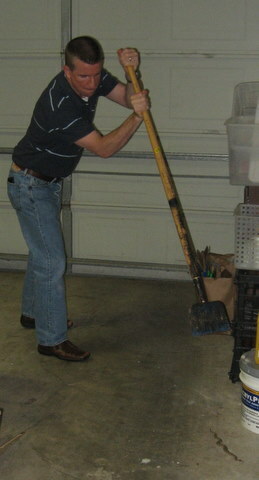 But, Hubby took care of it with his heroic “attacking the Hydra stance”. BLECH! OK, yeah… it was tiny, but we’ve heard that the smaller ones have stronger venom. That may be an old wives’ tale, but it sure creeped us out. (Be sure to notice the industrial-sized bucket of tile mastic from our half-failed attempt at tiling our own bathroom). 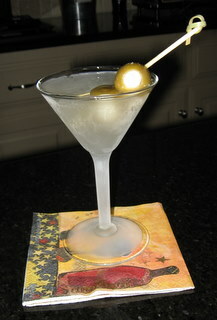 I tried a martini made with Tanqueray Rangpur gin this week. It was really yummy, but a bit too citrus-y for a martini, in my opinion. I think, however, that it’s lime essences would be OUTSTANDING in a gin and tonic. It had a very limited distribution and isn’t even showing up on Tanqueray’s website anymore (I think it’s meant to be seasonal/summery), but they still had plenty of it at my local liquor store. Give it a try! Have a great day and we’re thrilled that you guys are moving back home! Author laraPosted on September 29, 2007 Categories MiscLeave a comment on Happy Birthday Staci! 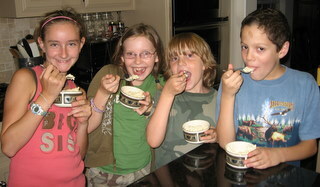 Each of the kids had a friend (or a cousin, as the case was for Girl) spend the night a couple of weeks ago and we decided to let the kids make ice cream in our Play & Freeze Ice Cream Ball. We had used this once before, on vacation, and it was a lot of fun. 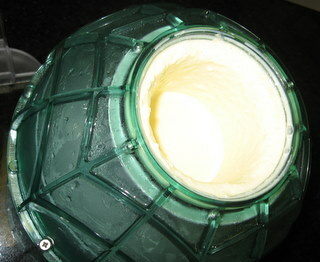 The recipe that comes with the ball should be discarded – it makes a “soft serve” ice cream that is too soft to be worth all of the effort, in my opinion. 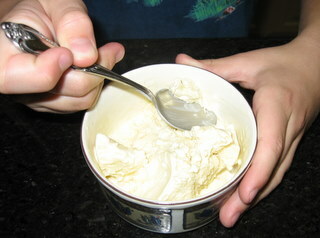 I would highly recommend making a custard-type recipe, instead (mine can be found here), because it will make your finished product more like “real” ice cream. Yes, it’s more effort, but you’re already going to the trouble of making homemade ice cream, so you might as well go ahead and make it good, right? The kids enjoyed using the ball-maker, although they do get a little tired/bored toward the end of the 20 minutes or so of rolling the ball around that is required. It also tends to be a little NOISY – so noisy that just about the time that you’re ready to slice off your own ears with a mandoline to escape from all of the salty ice water rattling around, voila, you have ice cream. The risotto recipe is from this month’s (Oct 2007) issue of Bon Appetit magazine. It was a HUGE hit with all of us, so I will definitely be doing more risottos this year, as the weather gets cooler. This recipe was really simple, too, very non-intimidating. The butternut squash were from my in-laws farm. In the magazine, the risotto was served with crispy cornmeal-breaded shrimp, but that would NOT have gone over with Hubby or Girl. It’s a shame, because it sounded really good. We’re taking Boy to his favorite restaurant for his birthday on Friday, so he’ll get his seafood “fix” then. The spinach was just sauteed in a little olive oil until softened and wilted and then sprinkled with a TINY bit of Baby Bam seasoning. The chicken tenders were marinated in a little BBQ sauce and then grilled and served with more BBQ sauce (not the same as it was marinated in!) on the side. Actually a very easy/quick dinner – surprisingly so. I have apparently done something to please the TV programming gods…..
and then, some of this. PS – Has anyone tried “Rangpur” gin yet? Author laraPosted on September 19, 2007 Categories MiscLeave a comment on I have apparently done something to please the TV programming gods….. 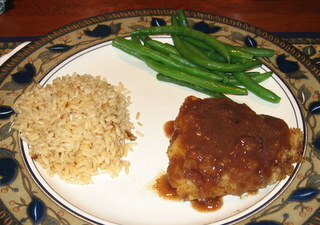 This recipe is from September 2003 Cooking Light magazine. 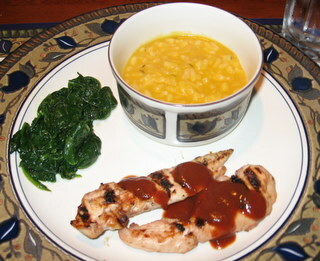 Usually, Hubby doesn’t care for “sweet” sauces, but this was a hit with everyone! Instead of using entire chicken breasts, I cut each breast into 3 pieces, for a smaller portion size. We loved this recipe so much, that I’ve decided to adapt it again. I guess having the chorizo on hand (for the breakfast tacos) had me thinking “Spanish”. It’s not Romanesco cauliflower season yet, so I substituted asparagus (sauteed in a little garlic and olive oil), instead – peas would be good, too. We are not fans of clams, so I used two shredded chicken breasts (leftover from the rotisserie chicken that I used in the tortilla soup – it’s been stowed in the freezer since then) and the remaining half-link of chorizo left over from the breakfast tacos. I also added a little bit of pimenton (Spanish smoked paprika) to the sauce when I added the saffron. I also baked the dish in a large casserole instead of the individual dishes, just for simplicity. This photo was taken before I sprinkled the parsley on top. Believe it or not, this dish came together in all of 10 minutes. 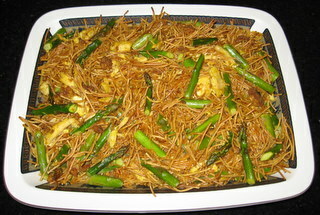 The most time-consuming thing was washing and cutting the asparagus. The chicken and chorizo were already cooked; I had pre-toasted the fideos a couple of days ago when I was working in the kitchen and already had the oven going. Yay – forethought! This is going to be lunch for Hubby and me, but I’m sure we’ll have some leftover for the kids for their lunches tomorrow. We haven’t even eaten it yet, but it sure smells good! I already have something else planned for dinner tonight (stay tuned). I know that I’ve posted something very similar here before, but I thought I’d add this one, too, since I home-fried the potatoes this time and used a couple of different ingredients. Heat oil over medium-high heat in a large skillet. Add garlic and onions and saute briefly until softened and translucent. Add potatoes and stir until they are lightly coated with oil. Continue cooking potatoes, stirring occasionally until they are softened and browned all over. While potatoes are cooking, start to cook sausage. I cooked the sausage on the grill and then removed the casing, but you could also take it out of the casing beforehand and then brown it, like hamburger meat, in a separate skillet. 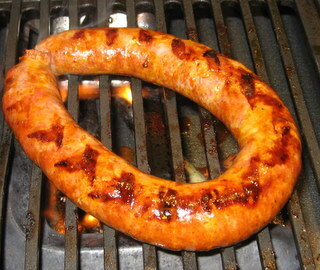 Either way, you need to blot or drain the grease off; chorizo is pretty greasy. 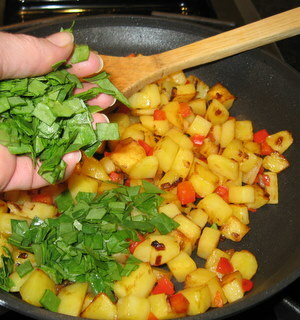 When the potatoes are pretty well browned on all sides, add the bell pepper and spinach to them, lower the heat a little and continue cooking until both vegetables have wilted. 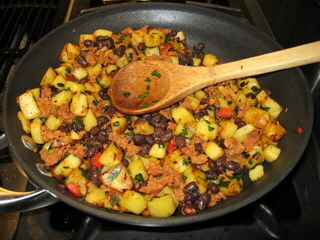 When the veggies have softened, add the black beans and continue cooking and stirring. When the sausage is done (remove it from the casing and blot and crumble it if you’ve grilled it), add half of it to the potato mixture and stir. Scramble the eggs in a separate pan (or in the pan that you cooked the chorizo in, using a bit of the sausage fat to cook them). 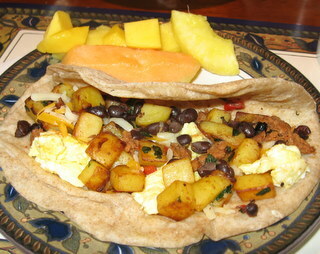 Fill the tortillas with some of the potato mixture, some of the scrambled eggs and a bit of the cheese. Serve with some tropical fruits (we had mango and pineapple). Dig in! NB: This time we scrambled the eggs separately, because Hubby was afraid that Boy and Girl would balk at the blend of different ingredients in the potatoes (they didn’t). So, the next time that we make this, I would probably just crack the eggs into the potato mixture and cook and stir until they are done and then just have all of the filling ingredients mixed together. I’ve been looking for some recipes for healthy, after-school treats now that the kids are back in school. I found this recipe on epicurious and thought it might fit the bill. These turned out really well. I liked the extra-rich sweetness that the dark brown sugar added. I didn’t add the nuts, because Girl doesn’t care for them. 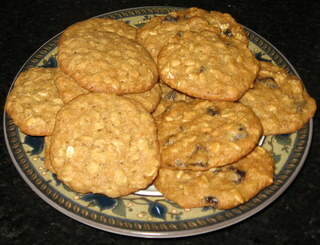 I made some without raisins, too, because Hubby says that raisins taste like dirt. I wanted to put some butterscotch chips in, but met resistance from Hubby. Maybe next time.